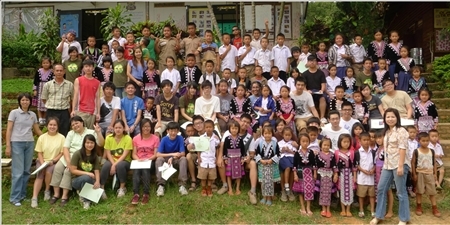 Students helped raise over 1.5 million baht to help disadvantaged hilltribe students. The Traidhos Visiting Schools Program (VSP) is an experiential activity program sharing a scenic green campus on the outskirts of Chiang Mai with Prem International School. While students at the school are studying hard in their classes, just next-door students from schools all over the world are experiencing new cultures, pushing comfort zones and creating lasting life experiences. Somewhere between the adrenaline of white water rafting and the calming influences of learning Thai culture, many VSP groups find time to enjoy some physical community service work while donating valuable resources to remote communities in the Northern Thai hillsides. VSP students have worked with Red Karen, White Karen, Big Eared Karen, Lisu, Lahu, Akha, Hmong, DaraAng, Palong, Shan and local northern Thai communities during their community projects. Projects have supported elephant camps, reforestation projects, orphanages and temples as well as many local schools. In the last twelve months VSP have hosted 2252 students from forty-two different schools from Asia, Africa, Australia, Middle East, America and Europe. Almost 75% of these schools decided to include a community service aspect to their trip. For some students they are gaining credits towards their future education, while for others, community service has become a focus of their trip for many months before they arrive in Thailand. Prior to their departure for Thailand, students take part in fundraising events, working to raise money to buy the materials that can serve the communities whom they will visit. Many of the communities that VSP work with are based in rural, hard-to-reach villages where funding and external support is often slow to materialize due to the additional transportation costs, inaccessible roads or low numbers of low income hill-tribe families attending the schools. The work that is completed through the community service programs often provide a lifeline for these schools and give inspiration for students who may otherwise be given no incentive to study. Meeting foreign students is not only exciting for the Thai and hill-tribe students but also an eye-opening experience for the visiting school students too, many of whom have rarely had an opportunity to mix with smiley, enthusiastic young children who are living a simple life in a far-off secluded little village. VSP announced that thanks to this international desire to help others, 1,515,000 baht has been donated through thirty-seven different community service group projects this year. The students’ projects included school playgrounds built from used tyres, schoolyard murals, renovating classrooms and community temples, building toilets blocks and shower rooms, providing classroom desks and digging drainage canals. They also dug tilled land for school gardens and fishponds to help remote schools find sustainable solutions to provide healthy meals. Student donations provided building materials, cupboards, water containers, clothes, fans, games, classroom materials and much more to help create safer, cleaner and enjoyable learning environments for the hill tribe children they came to help. If you have been inspired and are thinking that you too may be able to find a group of students who could rise to the challenge and support a community service project then contact Michael Cumes [email protected] or http://vsp.threegeneration.org/index.html. 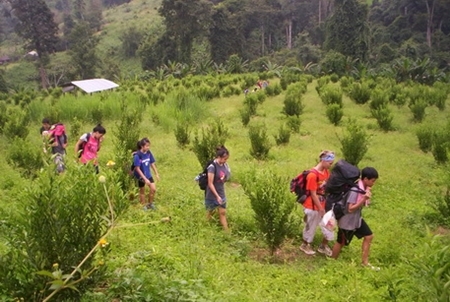 Students took part in a two day trek from Mae Taeng to Chiang Dao. Beginning this 2012 school term, the Prem International School has introduced the Bronze International Award (IA) program, also known as the Duke of Edinburgh Award, as part of its curriculum to all its Grade 9 students. Certified IA Leader, Adam Peacock of the Visiting Schools Program (VSP), leads the thirty-eight students through this exciting self-development program with the assistance of Prem and VSP staff. Pre-training courses are held on the Prem campus to introduce the students to many outdoor essentials including activities on the low ropes course, first aid, orienteering skills and raft building in preparation for their practice and final two-day adventurous journey trips. Students are expected to utilize the skills they learnt during the training sessions, packing their gear, sleeping outdoors as well as carrying their food supplies and cooking the groups’ dinner on their expeditions. The first trip was completed by class 9E along with Ajarn Emma and Ajarn Steve, who met the VSP team at the school entrance on a beautiful, sunny Saturday morning. After redistributing the first aid kits and maps, all working on the skills learnt in the preparation days, the group set off to the start of the two day trek from Mae Taeng to Chiang Dao just north of Chiang Mai. The first part of the trek wound around a stream and ended at the first checkpoint at the bottom of a stunning waterfall for a quick stop and a swim for those who wanted it. The straightforward instructions included a simple phrase to “keep going up until you reach the next checkpoint” - and it went up, and up, and up! After many stops and much huffing and puffing all groups made it to checkpoint two only to realize the uphill wasn’t over. Throughout the day the group weaved up and down through the forest, hill tribe villages, and farmland with a continuous panoramic view of the mountains of the north. All groups arrived at camp before dark and began to set up mosquito nets and mats for sleep in a village hut; followed then by the serious business of cooking made much more the challenge by a sudden change of weather - a rainy season rain storm. After a good sleep, breakfast and a cleanup they once again set off together for the second and final day of the hike. Due to the rain the night before but everyone worked together to help one another slipping and sliding through the muddy bits. Lunchtime was spent around a stream relaxing and making observations of the natural environment around them, including the discovery of an amazingly beautiful wandering spider which crossed their path. After a short rest they set off with the promise of an end in sight. Many uphill challenges later, the exhausted party arrived at the end of the trek. Tired, hungry but rightfully very proud of their accomplishment more than a few fell asleep on the way back to school. The final adventurous journey will take place later in the school year implementing lessons learned from the practice run and developing new skills such as compass reading, setting up a campsite and sleeping in tents. Next term all grade 9 students will continue the International Award training and complete the Adventurous journey element with a two day canoe trip. In addition, to this element students are selecting Exploria activities to cover the service, skill and physical recreation elements of the award.